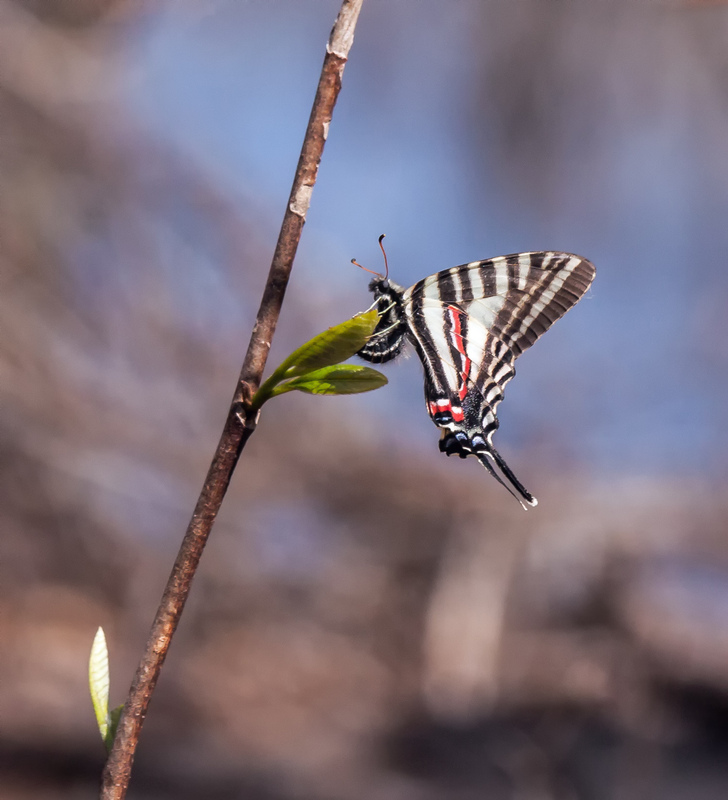 As we move deeper into spring, more and more butterflies are starting to appear, like this beautiful Zebra Swallowtail (Protographium marcellus) that I spotted yesterday at Accotink Bay Wildlife Refuge. Zebra Swallowtails are most often associated with pawpaw trees, which is helpful to know, though I must confess I don’t know how to identify a pawpaw tree. What I do know is that these butterflies are constantly on the move and fly in such an erratic way that I have trouble getting a decent photograph of one. 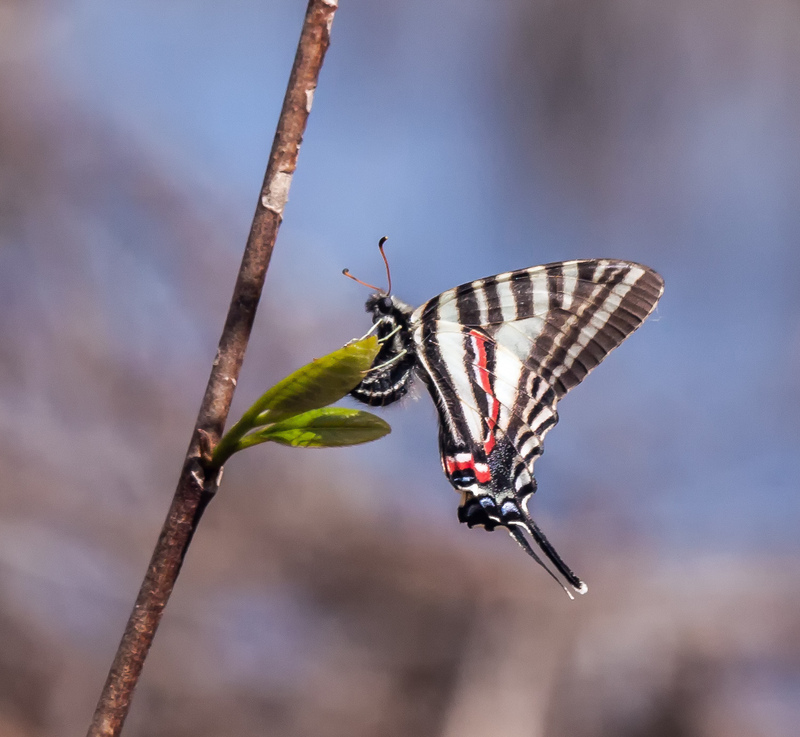 Yesterday I managed to get a shot of a Zebra Swallowtail when it paused momentarily at a small tree, perhaps a possible pawpaw. 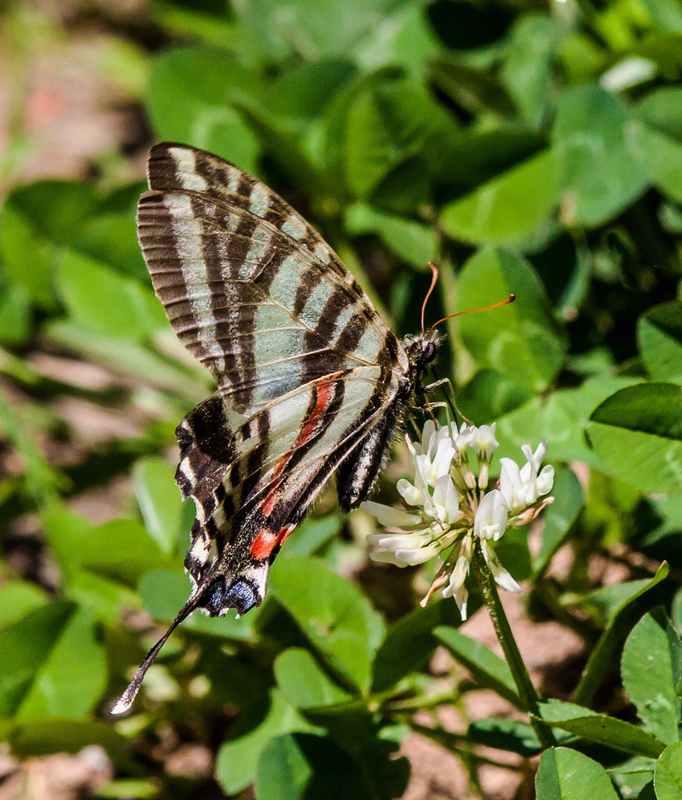 What I like about the shot is that it shows well the colors of the butterfly as well as its long “tails.” I could not decide how much to crop the image, which was taken from a pretty good distance away, so I am including tow versions of the image. Personally I am drawn most to the second one, but recognize that many folks may prefer the first versions, which draws you more quickly to the butterfly’s beautiful details. 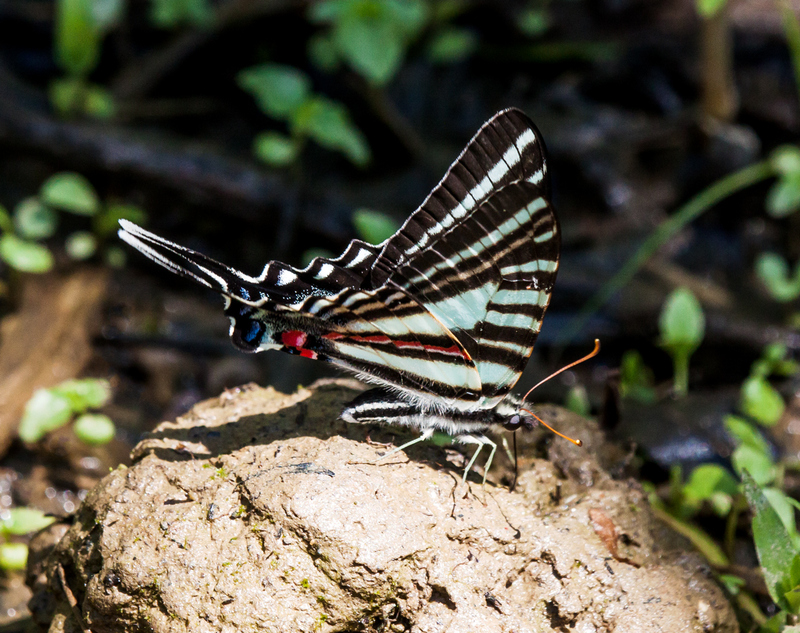 As I was exploring Accotink Bay Wildlife Refuge yesterday afternoon, Zebra Swallowtail butterflies (Protographium marcellus) kept fluttering by me. Occasionally one would perch for a moment within range and I was able to get a few shots. I really love the coloration and the shape of this beautiful butterfly that I rarely see. 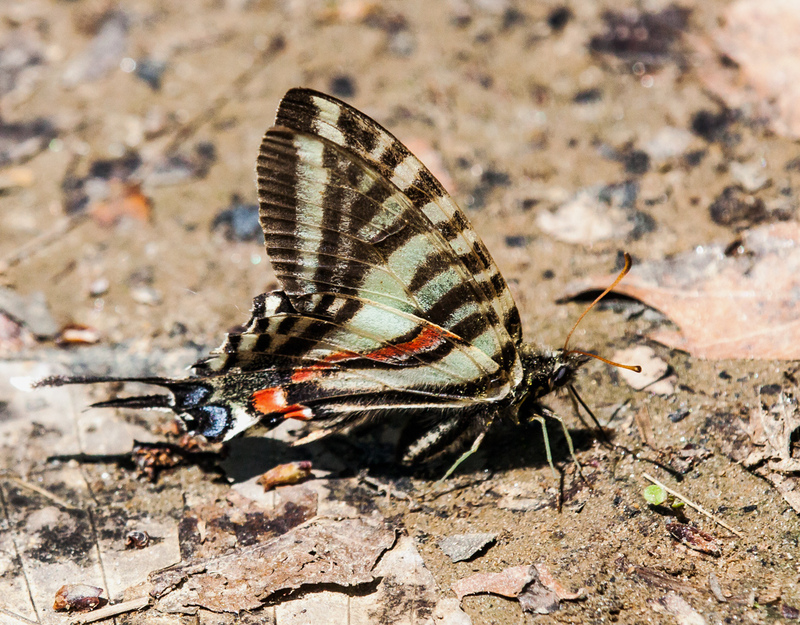 Although this butterfly is often associated with pawpaw trees, the ones that I saw perched mostly on the ground and seem to be obtaining either water or minerals.